ALEXANDRIA, Ky. -- Jen Stansbury Koenig might not be well enough to join her extended family for Thanksgiving this year. The 39-year-old mom has the immune system of an infant, with just a small fraction of the infection-fighting white blood cells that a typical adult has. A hug from a sniffling relative or an errant cough at the dinner table could be enough to cause her serious harm. But for Koenig, that new fragility is one of the many things she’s grateful for this holiday season. That’s because it’s part of her recovery after an innovative stem cell transplant to treat the multiple sclerosis that was stealing her mobility and limiting her life. WCPO first told Koenig’s story in September online and on air. She and her husband, Andy, were preparing to leave for Chicago to begin her treatment. Koenig likened it to a bone marrow transplant for people with autoimmune diseases. The technical name for it is a hematopoietic stem cell transplant, or HSCT. Family and friends helped raise about $15,000 to help pay for the treatment’s $125,000 down payment after Koenig’s insurance company reversed its decision and declined to cover the procedure. Koenig’s parents and in-laws funded the rest. The insurance issue is what drew us to Koenig’s story in the first place. We know that, sadly, there are scores of people in Greater Cincinnati who struggle with MS daily. When Koenig told us about having her hopes lifted by an approval from her insurance company, and then dashed a week later when the company reversed itself, we wanted to learn more. 9 On Your Side Good Morning TriState anchor Kathrine Nero and I explored that in our initial stories. 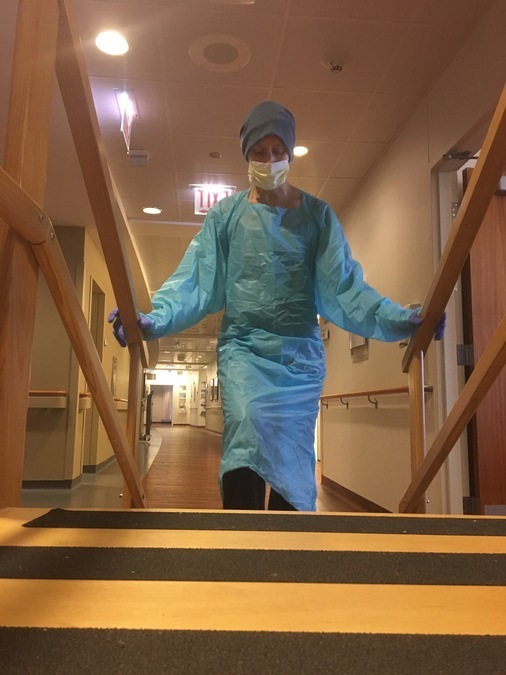 We got such strong reactions from readers and viewers that we decided to check back to see how Koenig has been doing, a month after the transplant she considered her last, best chance. And while it’s too soon for the major changes that Koenig hopes will come as her new immune system gets stronger, she and her husband already have noticed significant changes. • The nerve pain in Koenig’s feet and the pins and needles burning sensation that she used to experience have disappeared. • She can bend her left knee for the first time in two years. • And she can move the toes on her left foot, something she also hadn’t been able to do for years. Differences like that might be difficult to notice for people who don’t know Koenig well or see her often. But not for those closest to her. “I’ve noticed a huge difference,” Andy Koenig said. “I would say she’s gotten like 15 percent better.” Now, if you can walk just fine and bend both your knees and move your toes without any trouble, none of this might sound like a big deal to you. But what Jen and Andy Koenig understand is that these are important steps toward their ultimate goal. 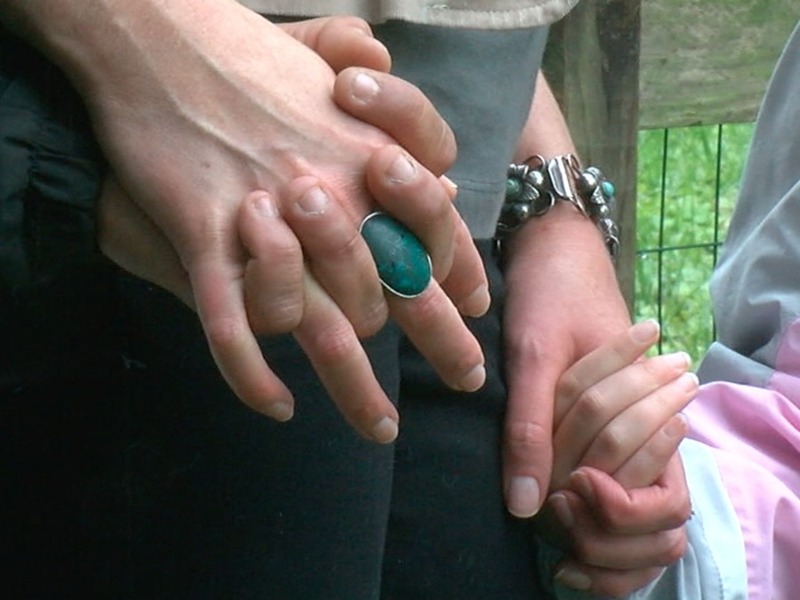 They want Jen Koenig to be able to take their 7-year-old daughter, Adelaide, to the zoo and walk around and see the animals without needing another adult to be there. 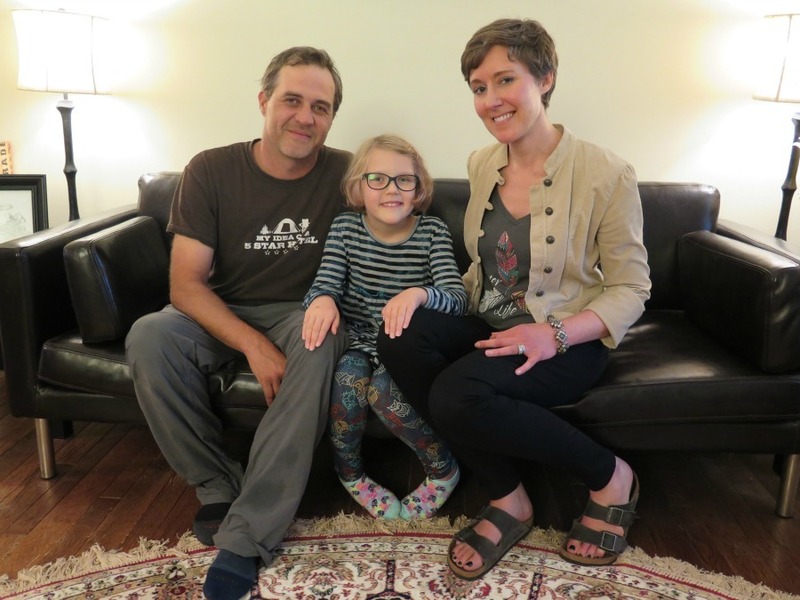 From left, Andy, Adelaide and Jen Koenig before Jen Koenig started her treatment. Before she was diagnosed with MS, Koenig used to climb rocks and hike trails and camp under the stars. She is hoping the stem cell transplant can stop the progression of her disease, like it has for so many other patients, and even reverse some of her disability. So far, she hasn’t experienced any complications, and Koenig is grateful for that, too. That doesn’t mean it’s been easy. Her time in Chicago included six days of injections to boost her production of stem cells. Those injections caused a lot of bone pain, and Koenig could do little more than rest. When it was time to harvest her stem cells, she had to get an intravenous catheter in her jugular and wait for the six and a half hours that procedure took. But Koenig was grateful for all those steps along the way, too, she said, because she knew each one would take her closer to her goal of getting better. Koenig got to come home to Northern Kentucky for Adelaide’s seventh birthday. 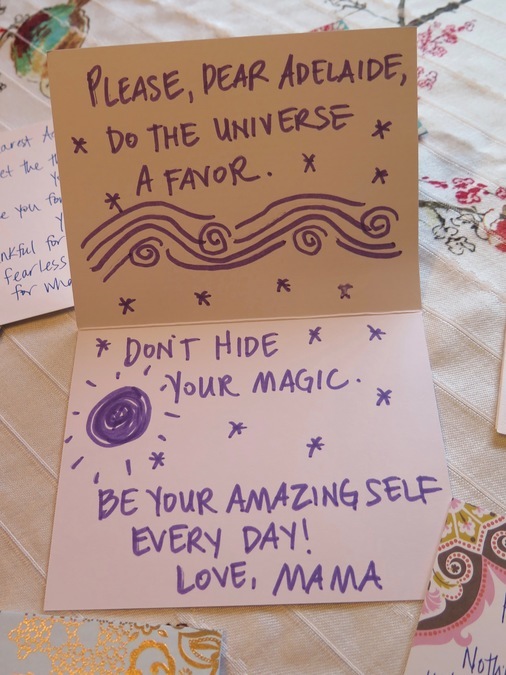 She had time to write special notes for her daughter to open each day her mom and dad were gone for the transplant. This was one of Adelaide's favorite notes that her mom left for her. Once back in Chicago, Koenig had chemotherapy for five days in a row until her white blood cell level was too low to count. Then it was time for her to get the stem cells that had been harvested during the first trip so her new immune system could begin to grow. She spent 15 days in the hospital until her white blood cell count was high enough for her to go home. And as long as that felt, and as tiresome as it was to have the constant nursing and needles, Koenig said she remained thankful every step of the way. Koenig doesn’t consider her lack of complications lucky. Rather, she attributes her success to “all the positive energy of the people supporting me” and her own positive mindset. For now, there is still a lot of healing to do. Koenig gets blood drawn each Monday to send off to Chicago so doctors there can monitor her progress. She’s getting physical therapy to retrain her brain and relearn the movements that MS had impeded. 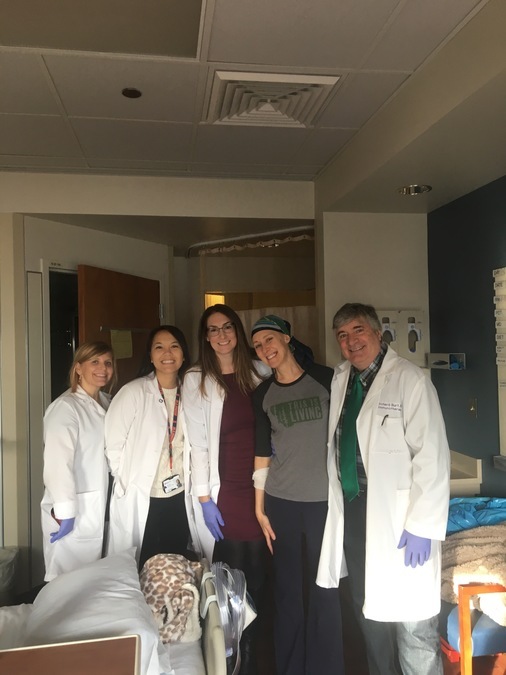 And in six months, she will get an MRI of her brain and spine to see if more lesions have formed or if the procedure has, indeed, halted the progression of her MS.
Jen Koenig, second from right, with her team of medical professionals. “I believe that it will,” she said. And she is determined to do everything she can to make that happen by eating healthy foods, exercising all she can and being mindful of every step she takes. There have been so many family members and friends who have been supportive, and Koenig and her husband are thankful for all of them. They’re also thankful for the doctors and nurses and even for the fact that Koenig’s MS was “bad enough” to make her a good candidate for the treatment. “Going through all of this helped me solidify my connection to the energy of others and the goodness in the world,” Koenig said. So even if Koenig decides it’s too soon for her to join her family around the Thanksgiving table, she has plenty to be thankful for today. She can wiggle her toes and bend her knees and look under the couch and bask in the glow of all those little things that point to the bigger improvements she hopes the future holds. You can read more about Koenig’s journey in her online blog or donate online to her Generosity Campaign . Lucy May writes about the people, places and issues that define our region – to celebrate what makes the Tri-State great and shine a spotlight on issues we need to address. To read more stories by Lucy, go to www.wcpo.com/may. To reach her, email lucy.may@wcpo.com . Follow her on Twitter @LucyMayCincy.